I am writing this blog because I have noticed an increase in the number of fractured and cracked teeth in my practice over the last 6-7 years as compared to the previous 15 or so years. Why is this? I don’t know for sure but there are likely multiple reasons for this, including old fillings, the type of restoration in the tooth, and teeth grinding- which I believe is the major cause of the increase. experienced dentists to diagnose and it is a perplexing issue for many. I am talking about situations like the one in the photo on the right, where the patient has a shallow filling and no evidence of decay or fracture on the x-ray. When I removed this filling due to pain, a fracture was seen and a root canal was needed because the pain did not go away, indicating a communication with the nerve of the tooth. I suspected this beforehand because there was a small filling only and no decay. What else could be causing the pain? The diagnosis is often made by a process of elimination. X-rays rarely show a fracture. Actually, there are some other factors that could be causing the pain, including headaches, joint problems, and sinus issues. This is what makes the diagnosis difficult. Early diagnosis will often result in a better prognosis for the tooth. Many fractured teeth end up needing root canals or extraction. Sometimes doing a crown will prevent this but it is hard to know when to do one. We want to be sure that the pain is not arising from another source, such as mentioned above. Craze lines on the chewing surfaces of teeth can often be mistaken for other, more serious types of cracks and it would be a mistake to initiate treatment on all teeth with these as it would result in unnecessary treatment much of the time. I would want more evidence of a problem before beginning treatment. What do I look for? Well, most commonly a patient will report pain upon chewing, especially with tough, grainy foods and sharp pain when something cold touches the tooth. Cracked teeth may have symptoms that range from slight to severe pain. 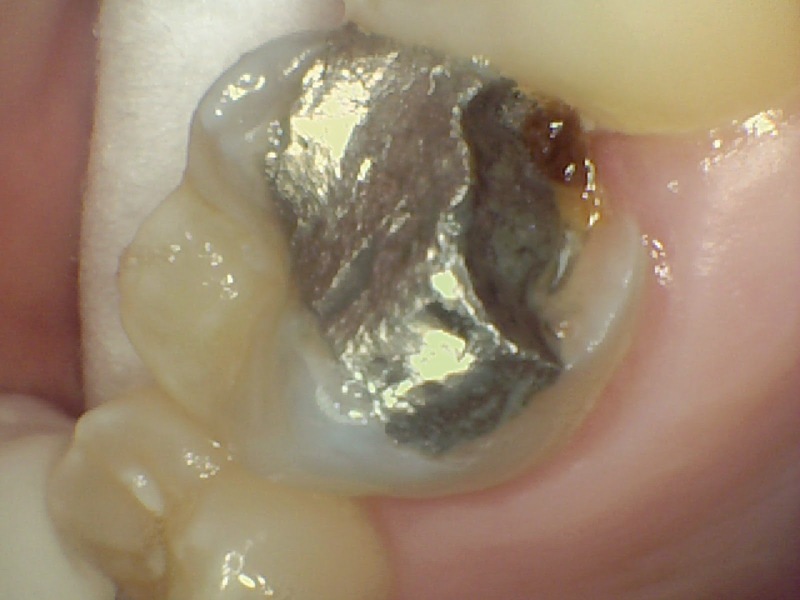 Some people point the finger at old silver fillings, which corrode and are often thought to cause teeth to break but that is controversial because I have seen fillings last for more than 30 years without causing teeth to crack. On the other hand, most of the broken teeth that I see have an old silver filling in them. Removing an existing filling always results in the loss of additional tooth structure so you want to have a good reason for doing it. 1) If a tooth has a filling (especially an old one) and there is pain that is persistent, it is best to remove the filling and evaluate even if the filling looks fine in the clinical exam and on the x-ray. Sometimes we will find just a little decay and we can replace the filling and that is all that is needed. Sometimes I will see a crack that goes deep into the tooth, indicating the need for a root canal and crown. In the worst case scenario, the fracture extends down the root and the tooth will need to be removed. 2) Early treatment leads to the best prognosis for the tooth. If a tooth breaks, it should be evaluated fairly soon. 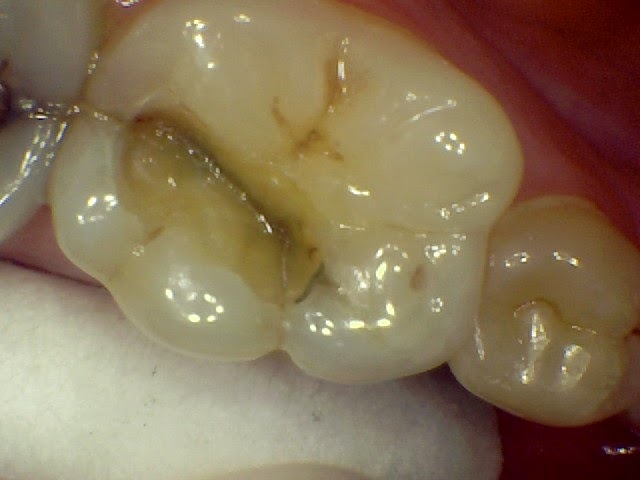 Decay will not happen rapidly but if there is a crack in the tooth, it would be best to protect the tooth with a new restoration, possibly a crown. 3) If there is persistent pain on a tooth, particularly upon biting, it should be looked at. It may be something else, like a sinus infection, (especially if the patient recently had a cold) or a jaw joint problem. If the pain is mild, sometimes we can monitor the tooth. The nerve may become inflamed, but that inflammation may be reversible and the pain may go away. A fracture into the nerve will result in pain that will not subside, however, and treatment will be necessary. 4) The most likely cause of an increase in tooth fractures is grinding of the teeth, thought to be caused by stress. People predominantly grind their teeth at night and I have witnessed how hard people can be on their teeth. A nightguard is recommended in those cases. Those who grind their teeth are more likely to create cracks in them but a nightguard can prevent the need for more extensive and expensive treatment, such as a root canal and crown, or even an extraction and implant. 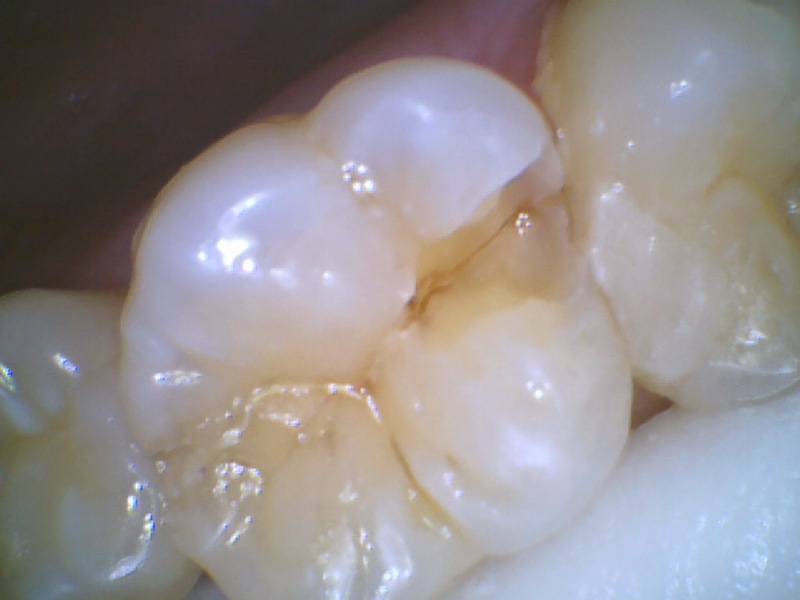 5) Evaluating a possible cracked tooth can be a challenge for any dentist. Other conditions can mimic tooth pain and it is important to be aware of that. This is an area in which there is an ovelap of medicine and dentistry. Many patients end up seeing both their physician and their dentist in order to find the source of their pain. This tooth below had no decay or filling but ended up with a fracture that extended down the root and needed to be extracted. Thank you Dr. Janis for this great article. If a cracked tooth is diagnosed early enough, do you think cranial sacral therapy would help to release tension in the head and jaw areas? I hope I don't have any cracked teeth because I know I clench at night especially when my stress is high. I'm glad I'm coming in to see you in the next few weeks. Thanks again! I really enjoy reading your blogs. See's Candy!! !...the lollipops and suckers! Interesting article, I never that much about cracked teeth or problems they can cause for people. Cheryl, I am not familiar with that type of therapy. However, bruxism, or teeth grinding, is thought to be a major cause of tooth fractures. Since grinding is often caused by stress, any reduction in stress will be beneficial.